The Grampians unique landscape is a phenomenal setting for a one of kind walking experience. The walk follows sections of the new Grampians Peaks Trail from Mount Zero via Halls Gap and south to Dunkeld. We’ve included walking on the unique western side of the mountains, portions of trail that will one day be part of the Grampians Peaks Trail. Walk through rugged, craggy-yet-strangely-beautiful landscapes with some of the best views seen by foot anywhere in Australia. The Grampians walks take you via Venus Baths, Grand Canyon, Elephant’s Hide, Silent Street and the Pinnacle. Explore Mt Stapylton in the Northern Grampians as well as MacKenzie Falls, Mount Zero, Rosea and Sturgeon and much more. This is the place to see Australian native fauna with cliffs and rough valleys providing refuge for many native animals, including kangaroos, wallabies, echidnas, koalas and an abundance of bird species. The sandy soil is ideal for native plants, making this national park famous for its spring wildflowers. There are over 800 varieties of indigenous plant species, many of them wildflowers which come into vivid bloom each spring. Start in Dunkeld if you’ve arrived by private vehicle or Stawell if you’ve arrived by public transport. No walking is scheduled for today, so you will have time to explore the fabulous walks right near your accommodation. Weathered over millions of years, Victoria’s Grampians National Park cover 168,000 hectares and are made entirely of sandstone that’s eroded to form several distinct mountain ranges. 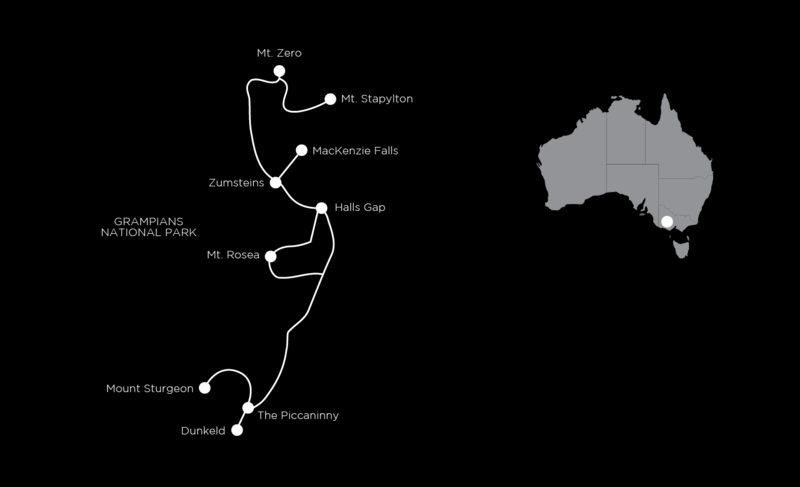 Today it’s the walk at the beginning of what will be the Grampians Peaks Trail, Mount Staplyton and Mount Zero. With a little bit of up and down this is a great start to this amazing walk. Look out for the wildlife in and around the track. The hardy vegetation in the Grampians is sustained by water coursing through streams, creeks, waterfalls and caves scattered throughout the ranges. The sandy soil is ideal for native plants, making this national park famous for its spring wildflowers. Today’s Grampians walk follows the track from out of your accommodation up to the top of MacKenzie Falls via Zumsteins. There are lots of options for more walking along the way. The Grampians sandstone is incredibly hard having resisted erosion for millions if not billions of years. Today’s Grampians walk traverses the fascinating Grand Canyon circuit through the Wonderland Range, passing many unusual rock formations including the Elephant’s Hide, Venus Baths, Guardian of the Canyon and Echo Cave as you climb to the Pinnacle. Today’s aim is the lofty heights of the Pinnacle Lookout. The return to Halls Gap is via Mackey’s Peak. The area has been an important source of food, water and shelter for Aboriginal people for 20,000 years and contains the majority of surviving Aboriginal rock art sites in South East Australia. The Grampians Peaks Trail has already been constructed to one of the real highlights of the overall track – Mount Rosea. This is the most challenging of all the walks and is another day full of high points including Sundial Peak, Lakeview Lookout and the walk up to Mt Rosea. There are lots of extra options along the way. Today we walk the southern end of the Grampians Peaks Trail, more specifically the Mount Sturgeon walk and the Piccaninnies. Beautiful views back to Mount Abrupt, over the Victoria Ranges, the Western Plains and the township of Dunkeld. We have left you with a little extra time this afternoon to explore Dunkeld or simply relax in the beautiful Royal Mail grounds. However, there is a nice walk out to the Arboretum that you can add in if you wish. Your holiday finishes after breakfast. The Grampians walks are mostly easy to negotiate and the tracks are reasonably well graded most of the time. However there are some rocky sections on the Grampians Peaks Trail. Full day walks average about 15km with some ups and downs. There are great opportunities for fit walkers to challenge themselves on least two of the days where we walk over 18km. We have sculpted this walking holiday so that it takes in the very best of the walking in the Grampians. The walking follows a linear path so there’s no backtracking. Just as importantly, we have managed to also reign in two of the very best accommodation experiences in Victoria with award winning food and unrivalled wine lists. We start the walk at Meringa Springs a small luxury lodge, restaurant and bar, a luxurious accommodation right next to the park. Situated 27 km north west of Halls Gap, this beautiful resort on the sunny side of the mountains has amazing views. The Royal Mail has two restaurants, Wickens at Royal Mail, and the casual diner, Parker Street Project, supported by an internationally recognised wine cellar, wine bar, landscaped gardens full of native plants, billabong inspired swimming pool and of course all the rooms have ensuites. The two course a la carte dinners in the restaurants are prepared by professional chefs, as are the cooked breakfasts. Day one of this holiday sees you spend the night in Wartook. Regular V-Line train and coach services to Stawell are available from Melbourne. We organise for you to be transferred from Stawell to your first accommodation. There is also the option of driving to your final nights’ accommodation in Dunkeld and leaving your vehicle here during this holiday. The Grampians walks finish on day seven in Dunkeld at the end of the Grampians Peaks Trail. For walkers who caught public transport there are V Line coach services to Ararat from where there are regular train services to Melbourne. The Grampians walks build nicely and can be as challenging as you wish it to be. There are extra walking opportunities here, so if you want more we are pleased to offer it. Overall this walk is moderate with some moderate to challenging days, with some flat sections along well-marked trails, gradual ascents to mountain summits for spectacular views, and some steep up hill and downhill sections to the forested valleys below. You’ll be walking an average 17 km a day. Those that enjoy the solitude of nature will appreciate some days where you are more likely to encounter echidnas and kangaroos rather than other people. There are five walking days on this seven day itinerary starting in Wartook and finishing in Dunkeld. We include accommodation from day one to day six, most meals, transfers and comprehensive trip notes and walking maps. We transfer your luggage to the next accommodation so you can focus on enjoying the walking with just your daypack and what you need for the day. September to November is usually warm. The summer months of December to March are likely to be warm, and sometimes quite hot. During summer, it is common to have daily temperatures in the 30s, with the nights remaining quite warm. April and May are cooler and the winter months of June through August can vary from cool to mild temperatures with the occasional cold, wet spell. The wildflowers are usually at their best between August and November – although there are always some flowers around. Not available during July.